An upgraded Soyuz spacecraft carrying veteran shuttle astronaut Scott Kelly, Soyuz commander Alexander Kaleri and flight engineer Oleg Skripochka blasted off from the Baikonur Cosmodrome in Kazakhstan late Thursday, kicking off a two-day flight to the International Space Station. Under a dark, pre-dawn sky, the first stage engines roared to life on time and the Soyuz rocket, trailing a sky-lighting plume of fiery exhaust, climbed away at 7:10:55 p.m. EDT (23:10:55 GMT). Looking on with family members, dignitaries and U.S. and Russian space officials was Mark Kelly, Scott Kelly's twin brother, who will command the shuttle Endeavour during a space station assembly flight in February. If the schedule holds up, it will be the first time "two blood relatives have ever been in space together," Kelly said in a pre-launch NASA interview. "It's exciting," he said. "I've obviously known my brother a really long time, and we're great friends and it's a real privilege to share the experience with someone you're so close to." During launch Thursday, live television views from inside the spacecraft showed Kelly in the Soyuz TMA-01M's right seat, with Kaleri in the center seat and Skripochka, the flight engineer, to his left. 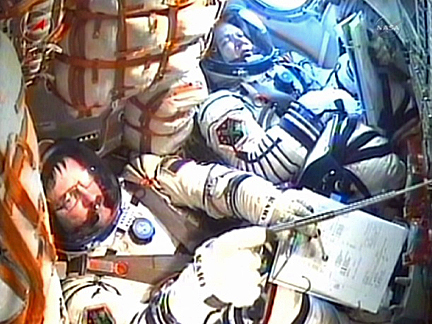 All three appeared relaxed and in good spirits as the rocket accelerated toward orbit, smiling and occasionally waving at the camera. "Thank you so much for all your hard work," Kaleri told supporters before launch. "We are prepared to start the work and with all the responsibility we have, I must say we are excited about this, especially for those who do this for the first time. Thank you." 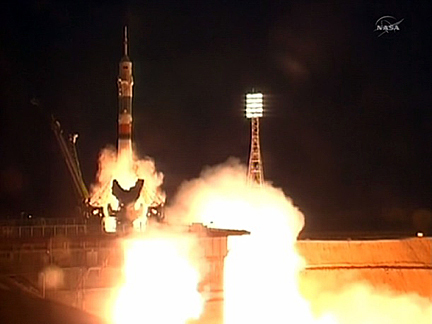 Eight and a half minutes after liftoff, the upgraded Soyuz TMA-01M spacecraft slipped into its planned preliminary orbit. Moments later, its two solar panels and antennas unfolded and Russian flight controllers said the spacecraft was in good shape as it set off after the International Space Station. If all goes well, Kaleri will oversee an automated docking at the upward-facing port of the Russian Poisk compartment atop the station's Zvezda command module around 8:02 p.m. Saturday (00:02 GMT Sunday). "Congratulations to you on a successful ascent to orbit," radioed chief flight director Vladimir Solovyov. "Everything looks nominal. We're going to analyze the issues you've been having during pre-launch operations. Otherwise, everything looks great. Have a good flight." The Soyuz TMA-01M spacecraft features a variety of avionics and computer upgrades that are being flown for the first time. "The improvements are rather significant," Kelly said in a NASA interview. 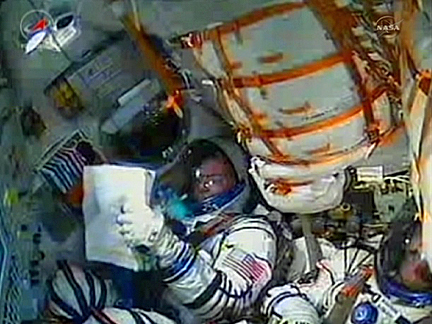 "The displays that the cosmonauts and myself ... use to control the vehicle have been upgraded to make flying it easier. It's less operator intensive. But the main and most important change is they have a new, what we would refer to as a flight control computer." The software used to control the spacecraft was tested in unmanned Progress supply ships, "but the Progress doesn't re-enter the same way as the Soyuz does," Kelly said. "So when we come home in March, it'll be the first time that this new flight control computer and the entry software will be demonstrated in flight." 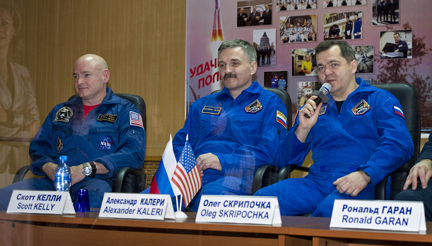 Kaleri, Kelly and Skripochka will join Expedition 25 commander Douglas Wheelock, Shannon Walker and Fyodor Yurchikhin aboard the station, boosting the lab's crew size back to six. Wheelock, Walker and Yurchikhin are scheduled to depart at the end of November. Three fresh crew members -- Dmitri Kondratyev, Catherine Coleman and Paolo Nespoli -- are scheduled for launch Dec. 13, assuming an investigation into an apparent shipping mishap does not reveal any significant damage to their spacecraft. As of this writing, it's not yet clear if that flight will stay on schedule, but Russian managers believe that can switch to a backup spacecraft, if necessary, and still launch in December. The Soyuz TMA-01M spacecraft is the first to incorporate both newer, more powerful computer avionics systems and new digital displays for use by the crew. The new computer systems will allow the Soyuz computers to interface with the onboard computers in the Russian On-Orbit Segment of the station once docking is complete, allowing continuous monitoring of the Soyuz by Mission Control in Moscow. Both Soyuz 19 and Soyuz 22 incorporated the new digital “Neptune” display panels, and seven Progress resupply vehicles have used the new avionics computer systems. The Soyuz TMA-01M vehicle integrates those systems. 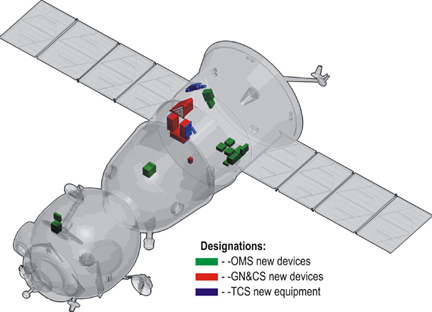 The majority of updated components are housed in the Soyuz instrumentation module. For launch, the new avionics systems reduce the weight of the spacecraft by approximately 150 pounds (70 kilograms), which allows a small increase in cargo-carrying capacity. Soyuz spacecraft are capable of carrying a limited amount of supplies for the crew’s use. This will increase the weight of supplies the spacecraft is capable of carrying, but will not provide any additional volume for bulky items. Once on orbit, the new digital data communications system will simplify life for the crew. Previous versions of the spacecraft, including both the Soyuz TM, which was used from 1986 to 2002, and the Soyuz TMA in use since 2002, required Mission Control Moscow to turn on the Soyuz computer systems periodically so that a partial set of parameters on the health of the vehicle could be downlinked for review. In addition, crew members were required to manually input undocking and deorbit data parameters to ensure the Soyuz was ready for an undocking and landing. The new system will eliminate the need for the crew to perform these checks and data updates, with Mission Control in Moscow uplinking the updates through the station’s computer system. The updates required some structural modifications to the Soyuz, including the installation of cold plates and an improved thermal system pump capable of rejecting the additional head generated by the new computer systems. The majority of Soyuz TMA systems remain unchanged. In use since 2002, the TMA increases safety, especially in descent and landing. It has smaller and more efficient computers and improved displays. In addition, the Soyuz TMA accommodates individuals as large as 1.9 meters (6 feet, 3 inches) tall and 95 kilograms (209 pounds), compared to 1.8 meters (6 feet) and 85 kilograms (187 pounds) in the earlier TM. Minimum crew member size for the TMA is 1.5 meters (4 feet, 11 inches) and 50 kilograms (110 pounds), compared to 1.6 meters (5 feet, 4 inches) and 56 kilograms (123 pounds) for the TM. Two new engines reduce landing speed and forces felt by crew members by 15 to 30 percent and a new entry control system and three-axis accelerometer increase landing accuracy. Instrumentation improvements include a color “glass cockpit,” which is easier to use and gives the crew more information, with hand controllers that can be secured under an instrument panel. All the new components in the Soyuz TMA can spend up to one year in space. New components and the entire TMA were rigorously tested on the ground, in hangar-drop tests, in airdrop tests and in space before the spacecraft was declared flight-ready. For example, the accelerometer and associated software, as well as modified boosters (incorporated to cope with the TMA’s additional mass), were tested on flights of Progress unpiloted supply spacecraft, while the new cooling system was tested on two Soyuz TM flights. Descent module structural modifications, seats and seat shock absorbers were tested in hangar drop tests. Landing system modifications, including associated software upgrades, were tested in a series of air drop tests. Additionally, extensive tests of systems and components were conducted on the ground. Russian engineers are readying an upgraded Soyuz TMA-01M spacecraft for launch Thursday evening from the Baikonur Cosmodrome in Kazakhstan to ferry a veteran shuttle commander and two cosmonauts to the International Space Station. If all goes well, the trio will join the two-man one-woman Expedition 25 crew aboard the lab complex late Saturday, boosting the station's crew back to six. NASA astronaut Scott Kelly, Soyuz commander Alexander Kaleri and flight engineer Oleg Skripochka are scheduled for launch at 7:10:55 p.m. EDT (23:10:55 GMT) from the same pad used to launch the first Sputnik on Oct. 4, 1957, and Yuri Gagarin, the first man in space, on April 12, 1961. "The crew is ready for flight and I would like to thank everyone that created this vehicle and made sure it is ready for flight," Kaleri said at a pre-launch news conference Wednesday. "We're going to do our best and fulfill your expectations and your trust." If all goes well, Kaleri will oversee an automated docking at the upward-facing port of the Russian Poisk compartment atop the station's Zvezda command module at 8:02 p.m. Saturday (00:02 GMT Sunday). Kaleri, Kelly and Skripochka will serve as flight engineers during the remainder of Expedition 25, taking over as core members of Expedition 26, with Kelly in command, when Expedition 25 commander Douglas Wheelock, Shannon Walker and Fyodor Yurchikhin depart at the end of November. Three fresh crew members -- Dmitri Kondratyev, Catherine Coleman and Paolo Nespoli -- are scheduled to arrive in mid December, assuming an investigation into an apparent shipping mishap does not reveal any significant damage to their spacecraft. In what promises to be an extremely busy six months aboard the space station, the Expedition 25/26 crews will welcome two space shuttle crews, one in November and the other in late February, carry out three Russian spacewalks, and oversee dockings by Russian Progress supply ships, a European cargo craft and a Japanese logistics vehicle. "You are well prepared and ready to go on what I consider one of the most historic set of increments to be concluded on the ISS, and that's the last two shuttle assembly flights," NASA space station Program Manager Michael Suffredini told the crew Wednesday. "So given the significance of your expedition, I think it's most appropriate that you are launching from the very pad where spaceflight began 53 years ago. We just celebrated that birthday this Monday. So good luck, godspeed and we'll talk to you when you get to orbit." In an August interview, Kelly told CBS News he viewed command of the space station as similar to commanding a ship at sea. "What a perfect job for a Navy captain," he said. "It is much different from a shuttle mission. It's a marathon versus a sprint, there are crew dynamics issues that can be significant because your'e in this confined environment for such a long time. But just like on a shuttle, there are some aspects of the job that are absolutely the same. My priority is that none of the crew members get hurt, we don't break anything and we complete all our mission objectives." In a remarkable coincidence, the commander of the shuttle Endeavour, scheduled for launch Feb. 27, is Mark Kelly, Scott's twin brother. Endeavour originally was scheduled for launch last July, but the flight was delayed because of problems with its primary payload, a $2 billion particle physics experiment. 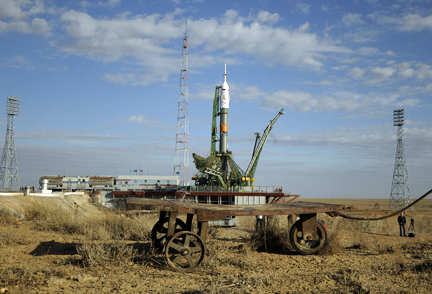 It now is scheduled for launch near the end of the Expedition 26 increment. If the schedule holds up, the Kelly brothers will be the first siblings in space at the same time. "I understand it's a human interest story," Scott told CBS News. "It will certainly be fun for us. But our primary focus is on our respective missions, doing them safely and completing all the mission objectives. It's kind of a neat thing, but certainly not by any stretch of the imagination the focus of these missions." Mark Kelly and other family members flew to Kazakhstan to watch the Soyuz launch Thursday evening. "As kids growing up we never thought we'd be in this unique and privileged position to be able to do this," Scott told reporters Wednesday. "My brother's launch was supposed to be in July, so it's really just a strange coincidence that it was delayed ... to the end of our increment. So from a personal aspect, it's interesting to us and it will certainly enhance the experience somewhat. However, that is absolutely secondary to both of our primary focus of completing the mission safely and completing all the mission objectives." 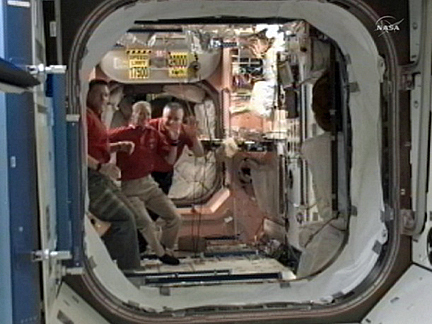 The International Space Station has been continuously staffed by rotating crews of NASA, Russian, European, Japanese and Canadian crew members since the first expedition arrived Nov. 2, 2000. Looking ahead to the 10th anniversary of the first manned flight to the outpost, Kelly said he was struck by the magnitude of the international effort it took to build the lab complex. "Then I think just how complicated and incredible an achievement it is to build this space station in different countries, using different technologies while orbiting the Earth at 17,500 mph in extremes of temperatures, in a radiation environment, put together by astronauts and cosmonauts in these very difficult to work spacesuits," he said. "I think it's probably one of the most difficult and complicated things human beings have accomplished." The Soyuz TMA-01M is an upgraded version of Russia's venerable Soyuz line, featuring lighter, more energy efficient avionics and computer hardware as well as improved software. According to a Russian fact sheet, 36 obsolete devices were replace by 19 new units and the overall mass of the spacecraft was decreased by 154 pounds. "It's a vehicle with updated on-board systems," Kaleri said, speaking through a translator. "The updates concern the motion control system and navigation, the telemetry system as well as the on-board computer complex, on-board measurement system. ... The current vehicle is different in the way the computer complex is secreted, with a different architecture that has different capabilities. It will provided new, interesting opportunities as far as motion control is concerned."